I can think of a few reasons why PC game reviewers might want to use a developer’s screenshots. First, it’s easier. Taking your own screenshots can sometimes be a hassle. 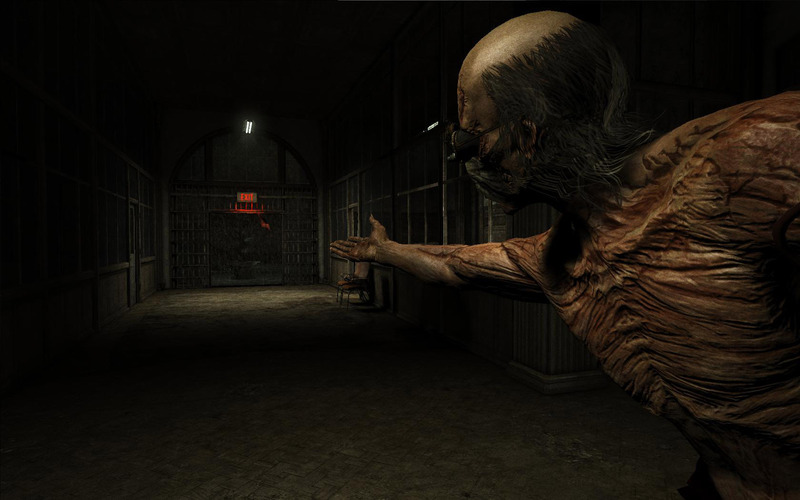 For instance, in Outlast, there’s a rather large, gruesome, angry fellow who sometimes chases you around, and upon catching you, tears off a sizable chunk of your body. The first time it happened to me, naturally, I was busy trying to make sure it didn’t happen to me. But, once it had happened, I thought it might be worth taking a picture of. So, when the game reloaded, I deliberately let him catch me so I could take some pictures of it. I had to do this a few times to get a decent shot of the brute throttling me. I realized I could get a better one, however, as lightning was flashing intermittently outside. During a lightning strike, the passageway was fully illuminated, casting shadows on the floor, and you could see the pouring rain outside. So, I went back, replayed the sequence, and sat there hammering the screenshot key until I captured a lightning strike, and submitted that image along with my review. In what turned out to be about a five or six hour game, I probably spent an additional half-hour or so just trying to take good pictures. Now, I realize staffers at sites and magazines don’t always have the time freelancers do (I am freelance). Playing and reviewing Outlast was one of only three writing commissions I had that week (unfortunately). A staffer might have multiple articles to write and games to play and interviews to conduct in a single day, and finding extra time to monkey around in a single game might not be the easiest thing to achieve. I totally get that, and I don’t have any kind of solution for a reviewer in a time crunch, except… I still think you should use your own screenshots, even if you don’t have extra time to go back, replay, and capture every image you’d like to snag. Another possible reason for using PR screenshots: they can make your review look pretty damn spectacular, especially on websites with a lot of real estate for images. There’s one popular game site that features huge, gorgeous, edge-to-edge splash images as a major part of their eye-catching format. That’s cool. Those developer images look (gruesomely) lovely on that site. The thing is, is that what the game really looked like for the reviewer? I don’t know. I don’t know what their reviewer saw. I only know what the developer wanted us to see: the images they selected. I should point out that the screenshots I personally took may not represent the game faithfully, either. I don’t have a top-of-the-line graphics card, and I don’t have a massively high-res monitor. For all I know, the average gamer’s experience with the game may look more like the PR screenshots than my own. The developers may be aghast when they see my screenshots in the magazine, and think, “This is terrible! Our game looks WAY better than that!” And, I can definitely understand them not being thrilled at the idea of someone reviewing their game in a magazine and not showing off the absolute best graphics the game can provide. BUT. Like I said, a review is a description of one reviewer’s experience. I can’t predict what another player’s time with the game will be like. I can’t speak for anyone but myself. My review will describe my experience: what I played, what I did, what I heard, and what I saw. I hope I’m not coming off as holier-than-thou, or some kind of purist snob, especially considering, like I said, this was my first real review. I’m really not trying to shame anyone who uses PR screenshots, because I understand the reasons for it, or at least I think I do. I don’t think it’s a huge deal, and it certainly seems to be a commonly accepted practice (of the 25 reviews of Outlast I’ve seen, only about ten of them appear to be using original screenshots). I’d just like other reviewers of PC games to think about the practice of using PR material in their reviews, and maybe reconsider it. I’ll refrain from calling anyone out specifically, but here’s a link to metacritic’s list of Outlast reviews, and if you start looking through them, you’ll start seeing the same handful of images in many of the reviews. Keep in mind, I’m only talking about PC game reviews. Previews are a different story (I assume, as I’ve never written one) as are console game reviews (Outlast, at the moment, is a PC-only title). I always use my own screenshots, I find it’s as much a part of my review as the text. It’s my experience, my impressions – and my interpretation of what I believe people want to know about the game. I’m surprised at how rare it is for reviewers to actually use their own screenshots. What better way to differentiate your review from all the others? Great write-up! Yeah, I typically don’t read many reviews, so it was a bit of a shock that the majority of sites (at least in this case of this game) weren’t using their own screens. I guess it’s not that rare, though. Hey Chris. This is probably not the place to contact you about this, but my girlfriend recently asked me to write reviews, video game reviews specifically, for the school newsletter. Being a huge fan since Livin’ in Oblivion, and having read every single one of the articles you posted since then, I immediately went to check out your PCGamer page for new articles, but my phone, iPad and laptop could not find your page, saying it was deleted/removed. Any idea what’s up with his? The only time when I didn’t use my own screenshots was when I simply couldn’t. My main PC died, with about a hundred screenshots from Dead Rising 2 Off the Record on it. All that hilarity, all that ridiculous carnage, lost. I had to use the stock PR shots. I agree that everyone that reviews games should use their own screenshots and their own footage. Otherwise, it just seems like they didn’t do much of an effort. Just a few. I’m not asking everyone to make 500 screenshots in Deus Ex HR and then choose 15 for the review. My screenshot count for Outlast: 421 shots taken. 95% of them, of course, are images of me JUST MISSING the image I was going for. And I know what it’s like to lose screenshots, or find out after a couple hours that Fraps hasn’t been taking pictures, or that you changed the keymapping and you’ve recorded nothing. It’s the worst. I come at it from another angle: I’ve spent a lot of years covering events, and going to be a photojournalist is just as important as being there to observe and write. When I review or preview a game, I’m doing both, and the screenshots are my camera. With this in mind, it never occurred to me to not use my own screenshots. “This is my experience,” as you say, is a good way to put it. I think because I blogged about gaming on my own for so long, and had no choice but to use my own screenshots (PR isn’t in the habit of sending media kits to random no-name bloggers), I just never considered using anything else. There was nothing else to consider! When I started writing for PCG, they reinforced my habit with their “take your own shots” policy. I think that’s part of why I was so surprised to see only about a third of the reviewers doing the same. I just assumed everyone did it. Totally agree, I don’t see much (if any) reason not to take screenshots on a PC Game. Most games work fine with the Steam overlay which takes shots, FRAPS is free (for basic options admittedly) and of course, there is always the handy print screen button. I might never go back through to get ‘perfect’ screenies, but I do try and take quite a lot through the game I am playing to tell the story of my experience with it. For what it’s worth, Chris, your screenies (esp for your comedy work) really add an extra special touch to your work. My friend and I still reference the creepy dockworker man from one of your sim playthroughs. BWAAAAM. I couldn’t agree more. I always take my own screenshots for my reviews and I also try to match them to the surrounding text as much as possible. When I’m describing the enemies and their crappy AI behaviour, I want a screenshot of a guard facing the wall while I am shooting at him. When I’m pointing out lapses in visual fidelity, I want a screenshot of a flowing river that looks like a solid object with a crappy animated texture.